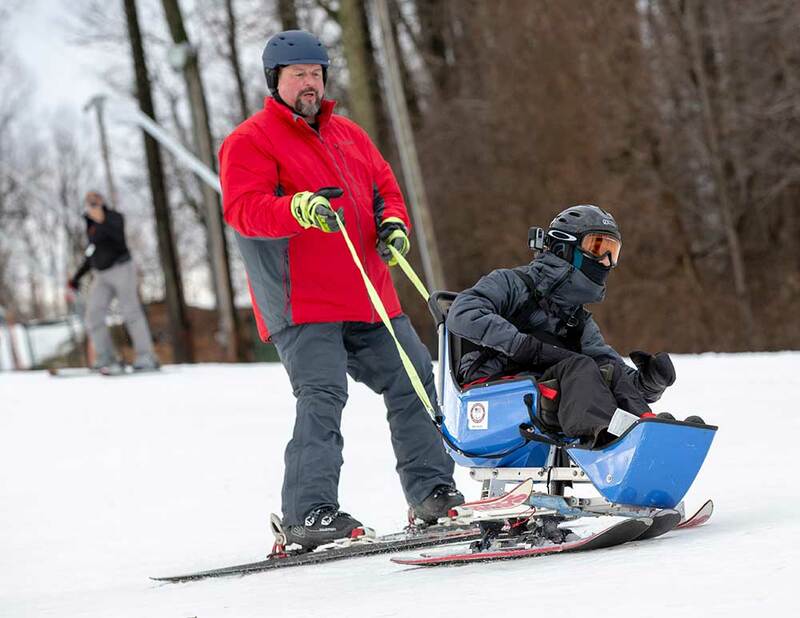 Jeff Marken of Baltimore Adapted Recreation and Sports helps guide Augusto Jose Delerme down the hill in a special chair adapted with skis. Delerme, who suffered a spinal cord injury, joined other adults who are recovering from traumatic injuries during Adaptive Ski Day. For Cody Willis, physical therapy on Feb. 8 wasn’t spent plodding along on the usual gym equipment or sandwiched between four walls in a hospital gym. Instead, Willis did his rehab work zipping down slopes at Roundtop Mountain Resort in Lewisberry, Pa. He was one of the people who have suffered traumatic injuries and were able to experience the thrill of skiing on Adaptive Ski Day. “Before my injury, sometimes I’d come up, sometimes I’d snowboard and sometimes I’d ski,” said Willis, who hurt his spinal cord during a motocross accident eight years ago. Today, he assists with the Department of Physical Medicine and Rehabilitation’s spinal cord injury peer mentoring program. He was joined by others who have suffered strokes, spinal cord injuries or amputations which might once have made winter sports seem impossible. Adaptive Ski Day is an annual event, hosted by the Department of Physical Medicine and Rehabilitation at Penn State Health Milton S. Hershey Medical Center, Penn State Health Rehabilitation Hospital, Ability Prosthetics and Orthotics Inc. and Baltimore Adaptive Recreation and Sports (BARS). Instructors with BARS coach rehabilitation patients on how to use adaptive equipment so they can ski and snowboard. “I’m going fast!” Willis yelled.